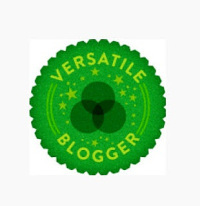 A big thank you to @amicgood and @willowbecker, who have nominated me for the Versatile Blogger Award. For those of you who have yet to meet Amy, she is an American writer currently living in Ireland. Her website is home to her blogs, short fiction and is a great resource for writers. She is also author of Rooted and founder of @FridayPhrases, a weekly micro-fiction Twitter meme, where you tweet and retweet stories and poems of 140 characters. I’ve archived my own here. It’s a great way to meet fellow writers, marvel at their creativity and share yours. It is also where I met @willowbecker, short story and flash fiction writer extraordinaire, who built the brand spanking new #FridayPhrases website and who can also be found at her online home Weird Little Worlds. The Versatile Blogger Award is given to writers who bring something special into your lives, whose love of words comes across on the page and who have a unique perspective. It’s wonderful to be chosen to receive the award, especially alongside fellow nominees, whose work I admire. Must buy you a pint of Guinness next time I’m up your way, Amy, and Willow, that house is ours ;). To accept the award, I have been asked to nominate 10-15 fellow bloggers and to tell you seven things about myself. @DrewChial for blazing with creativity in his choice of blog subjects, his short stories and his artwork, and for using different media when I’m still trying to get my head around the basics. @SiofraWrites I’m new to Siofra’s writing, but I have already fallen head over heels for her and her beautiful website. She writes fantasy and you can find stories and poems on her blog, in addition to recollections from her dreams. @TheGrahamMilne for his website Graham’s Crackers. He’s currently on a schedule working through his memory bank of songs that have made their mark on him. Whatever Graham writes about, it’s unpredictable and an eye opener. Visit @magicandmarvels’ blog for stories, poems and great photos. Carrie also writes great micro fiction for #FridayPhrases. The guys from @proseb4hohos (@wryson, @jedwardpaul, @johnweeast @Reckoner67 @alexnaderwrites) Enter the man cave, where facial hair and no pants are the norm. A mixture of wisdom and bare faced cheek in the most charming fashion, this blog will make you laugh out loud and scratch your chin. You’ll find short fiction, advice and reviews here. @NatashaA_Author has a wonderful site, full of thoughtful entries and a function where you can pose ‘Dear Rumi’ questions to the protagonist from her recently published romance novella Butterfly Season, which is on my reading list. On her website My Train of Thoughts On…, @okiewashere provides book reviews, musings and quotes. My favourite thing about Karen’s blog is the diversity of topics and the microscope into the lives of writers in her ’10 Statements’ series. 3. I have a four year old daughter and a one year old son. I saw another little girl in my dreams. She even has a name. I am torn between the little girl I may have and the writer’s life I am only just beginning to have again. 4. If I could upload information into my brain, like Neo ‘I Know Kung Fu’ does in The Matrix, I’d ask for drawing, painting, guitar, saxophone, Japanese and Kung Fu, in that order. Since that’s not going to happen anytime soon, I am having to make do with stick drawings and learning my chords painfully slowly. 5. I often have an image in my head that I link to people I know. I see my brother with his super flexible toe dangling oddly, my daughter eating strawberries in the summer, my son cheekily sticking his tongue out of the corner of his mouth, my friend L spinning around the dance floor with her hair crimped at university, my work colleague D down on one knee singing karaoke. The images stick, and they come into my head each time I think of that person. They are rarely replaced by newer ones, like I have stored away a business card that never changes. 6. There are certain movies – Amelie and Point Break – and certain tracks – Tracy Chapman’s ‘Fast Car’, Juli’s ‘Die Perfekte Welle’ and Muse’s ‘Starlight’ – that will always take me somewhere special. 7. I work best under pressure. If I’m up against a deadline, I morph into a Hindu goddess with four arms, existing in a zen-like state while I race through my to do list with apparent ease. It’s accomplishing things when there is more time that comes less easily, which is why setting small writing goals is the difference between me feeling happy and productive or lazy and full of doubt. That’s it for the Versatile Blog Award. Thanks again Amy and Willow. For my nominees, writing time is scarce so if you are unable to accept, I completely understand. Just know that your words comfort and inspire me, and make me think. Keep writing, and I’ll keep reading. Awww, thanks for such kind comments about my blog :) Though, I admit, I’m not quite sure what the Versatile Awards are. Loved the story about how you and your husband met. Such a cute story! Pleasure. They were new to me too :). He helped me mop up the water. Was v embarrassing! I will have a blog post up within a week. “Why is it raining upstairs?” is a unique beginning for a relationship. Previous Post How Relevant are Book Awards and Writing Competitions?